Good news for business website owners: the ESK Solutions have recently released a public beta version of a form builder for sites on LeadsCharger.com. The software is intended to gather information about the users and perspective clients via feedback forms more effectively. The key difference of this form builder on LeadCharger.com is an advanced capture technology which allows to gather and consolidate data even when the user has filled out only part of the entry fields and has not submitted the form. The product also has an impressive number of extra functions aimed at facilitating business processes and increasing online sales. The product will be useful to site owners who primarily deal with internet marketing. The form builder will help you create a convenient feedback form: select the necessary number of fields, the suitable color scheme, the font style, the window size and other attributes. To embed the form to your website, you do not need any special skills – the builder will do everything on its own. The only thing you need to do is to indicate the part of your website where you want the form. 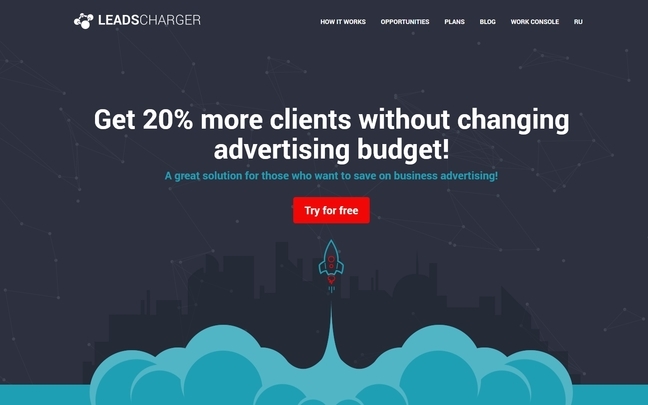 Besides site owners, leadscharger.com can be useful to web studios and developers. They will be able to provide their clients with more convenient and functional products. Leadscharger.com is primarily aimed at helping to use feedback forms on business websites. The form builder is successfully integrated with any engine. It does not matter whether you have dynamic pages in PHP or a static HTML site. The feedback forms are equally reliable in both cases. It has been calculated that capturing all the user’s data (even when they have not submitted the form) helps to increase the customer base by 20% which consequently leads to increasing sales and the return on advertising spend. The product is available free of charge as an alpha version and there are three paid plans differing by the number of functions. The form builder on leadscharger.com is a unique product of ESK Solutions who specialize in developing software for automated business processes, creating enterprise portals and cloud services, integrating and implementing ERP systems. The company offers a wide range of tools for modern businesses starting from complete out-of-the-box solutions for small enterprises and ending with complex development of multifunctional business systems from scratch.